“Kya Baa! Main kitta bulaya tumna, dekhech nai na. Akele baarish mein khadleko khareein kya!” he says accusingly, catching up with a friend who stands loaded plate in hand, guilt written all over his face. Nearby, rain drips off the tarpaulin and immolates itself in the angry coal below. 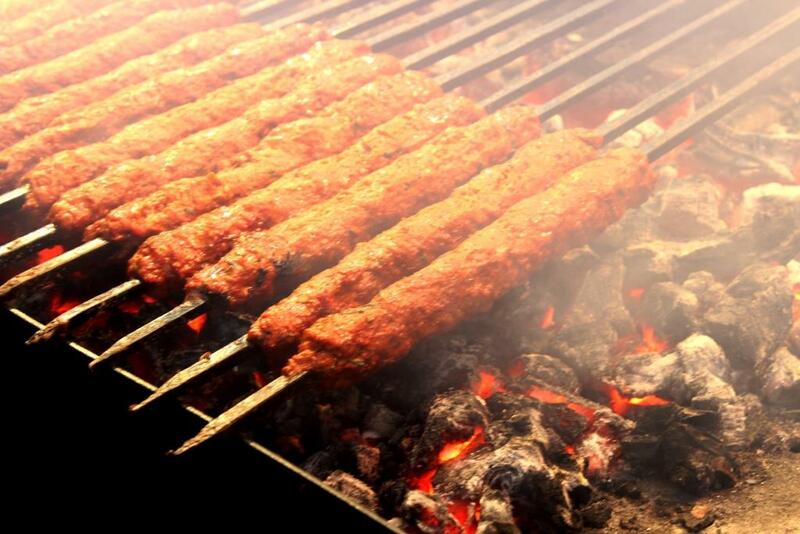 The sizzling grill belches smoke and covers us all with a thin layer of kabab flavoured mist. The cloudy evening has stimulated appetites along the length of MM (Madhavaraya Mudaliar) Road. Business is brisk. Commuters stop for a parcel and orders are issued from auto passengers at the signal. Scoop meat. Fill bag. Take money. Return change. Next! 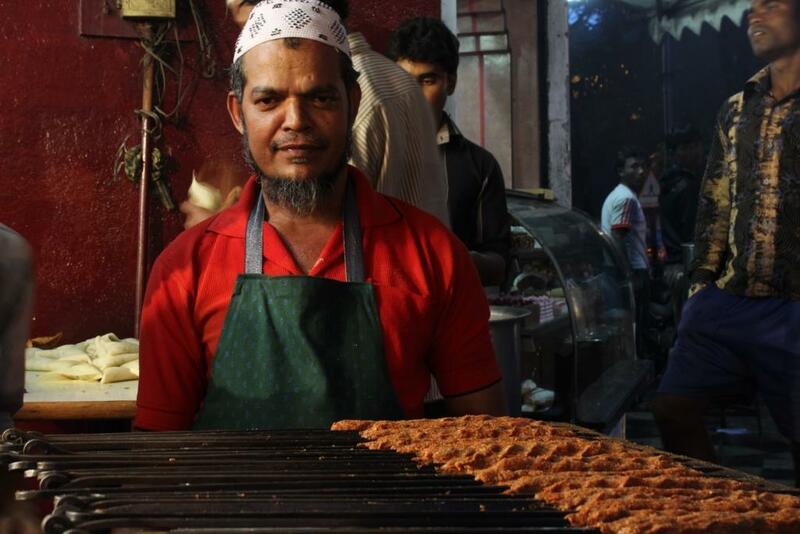 During Ramzaan, the sidewalks opposite the Hajee Ismail Sait Mosque are taken over by trays piled with crisp fried samosas, bondas, greasy chicken lollipops, pathar ka gosht, Chicken manjoori, Luqme kababs and slivers of `Tawa gosht’. Fried `baida roti’ with a delicate kheema filling, mutton tava `phaal’, oily chicken 65, flat mutton chops and bright red chicken tikkas impaled on skewers bewitch the weak willed who hold out their plates, hypnotised. Banners direct you to Pista House for its famous`authentic Hyderabadi Haleem’ while seekh kababs spit and hiss furiously on the grill. Other popular haunts are Richies Rahhams for Biriyani and Ali Baba for exotic Bhatkali and Middle Eastern cuisine. The stomach assumes high priority. The heart has taken a backseat. While Eid-ul Fitr marks the end of this cycle and is a time for biriyani and delicate`sevai’ decorated with cardamom and `chandi ka waraq’ or silver foil in my house, the month itself has us eating modestly all through. Ifter at home, is a simple, low calorie affair. But the scene before me is a complete revelation. 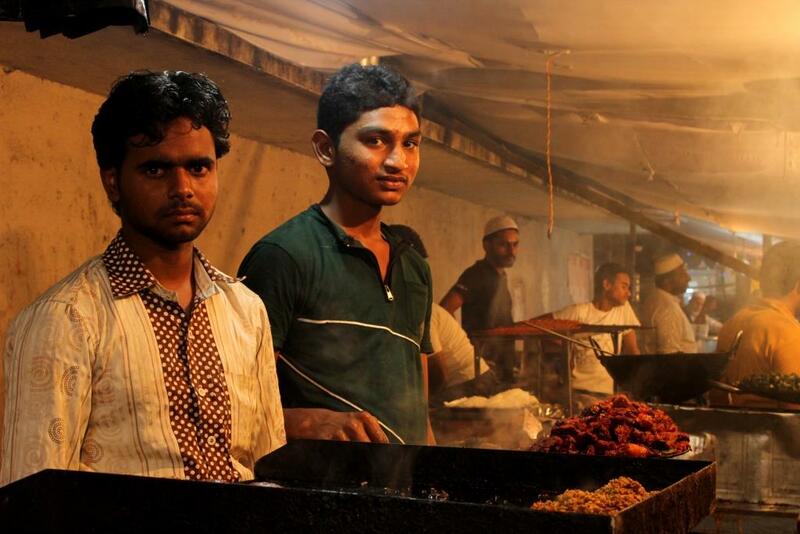 “Tumna kya hona, shishter?” shout the boys from Zayan Kabab Centre. The afore mentioned `shishter’ happens to be me, standing open mouthed in amazement. 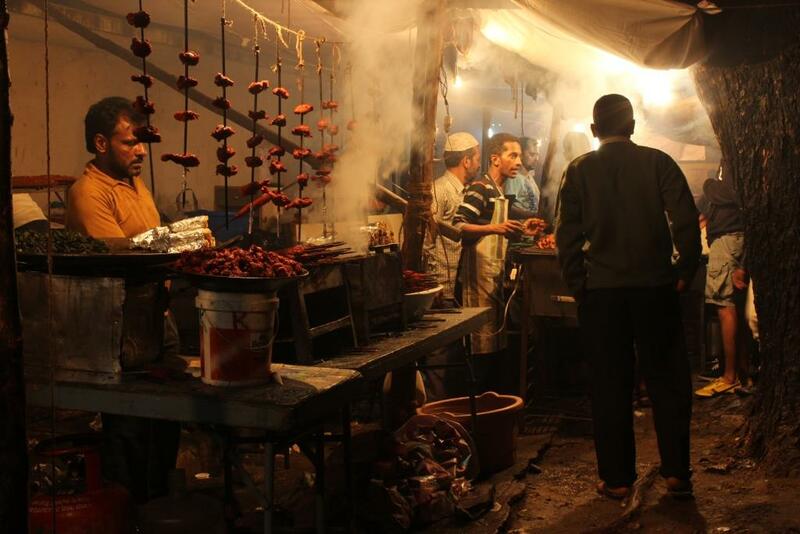 For years the food stalls of Fraser Town have fed urban legends while competing fiercely with the gullies of Shivajinagar. With self- confessed short sightedness, I have hitherto only haunted the latter. But out here it’s a wild- wild- east filled with foodies. A far cry from the Mootocherry (as Frazer Town was once called) originally inhabited by Eurasians parishioners and a Tamil migrant population. Happy co-existence.The Iyengar bun beside the Kheema one. 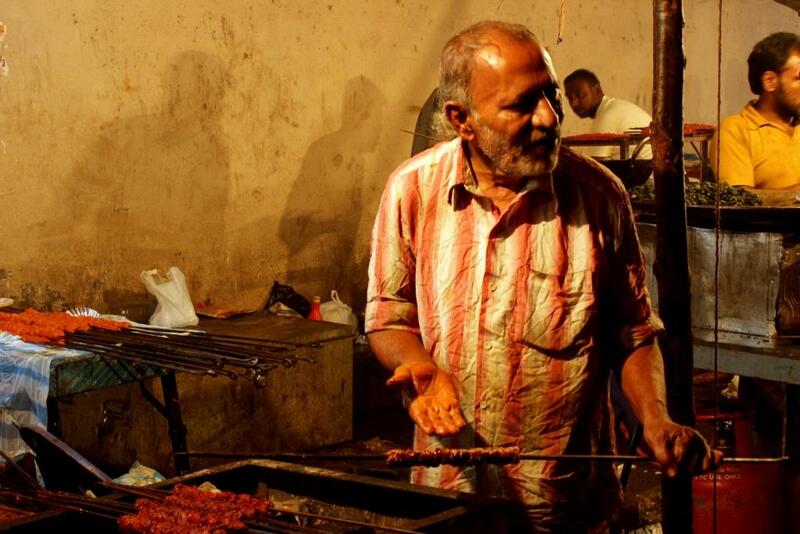 While the meat-fest breaks the fast at sunset, stalls open at around 6 pm and are patronised by people of all faiths, breaking bread together in a happy culinary heaven. I like how the festival gets complete strangers to eat together, united by a common love. Food. Ibad, the cheerful young man at Zayans’ looks at me enquiringly. I am confused and overwhelmed by such plenty. So I point to a row of little sausage like kababs and ask “ yeh kya hai?” “Laali kabab” shouts an enthusiastic Roshan, determined to display his knowledge of non-vegetarian nomenclature. “Lekin yeh laal nahin hain” I shout back triumphantly. Too late! They snigger. The aforementioned kababs are stuck onto little ice lolly sticks. Oh. 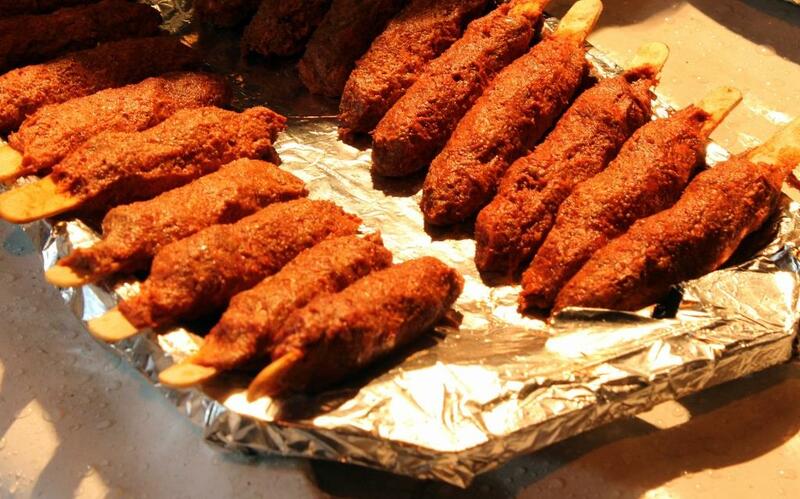 `Lolly’ Kababs! Brilliant. Chee! Stupid me. 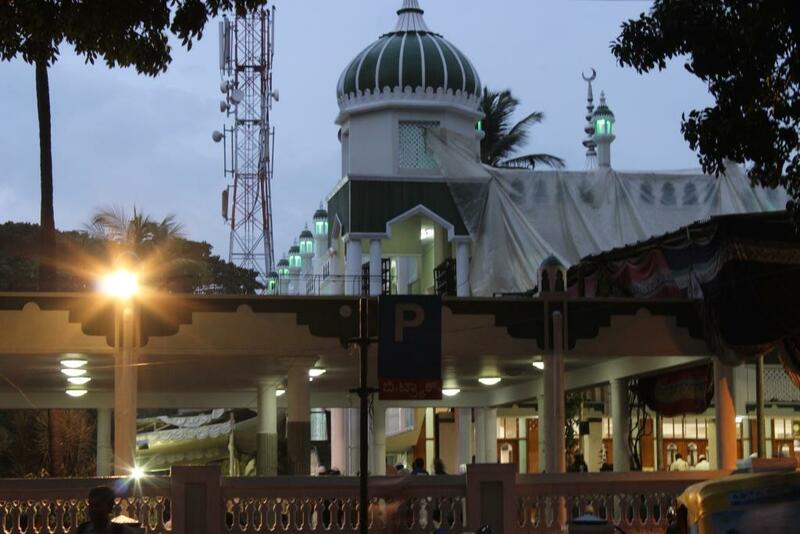 At this point, the azaan, a call to the evening Magrib namaz, wafts out through loudspeakers and across the locality. All activity ceases momentarily. The stall owners say their prayers, hurriedly bite into dates, bread and meat, sip water and its back to business as usual. If the holy month of Ramzaan is an exercise in self-restraint and contemplation, then this is will power at its best. Can I stand at the end of a day surrounded by piles of food and feasting people, with not a drop of water or food in me since dawn? For over a month? 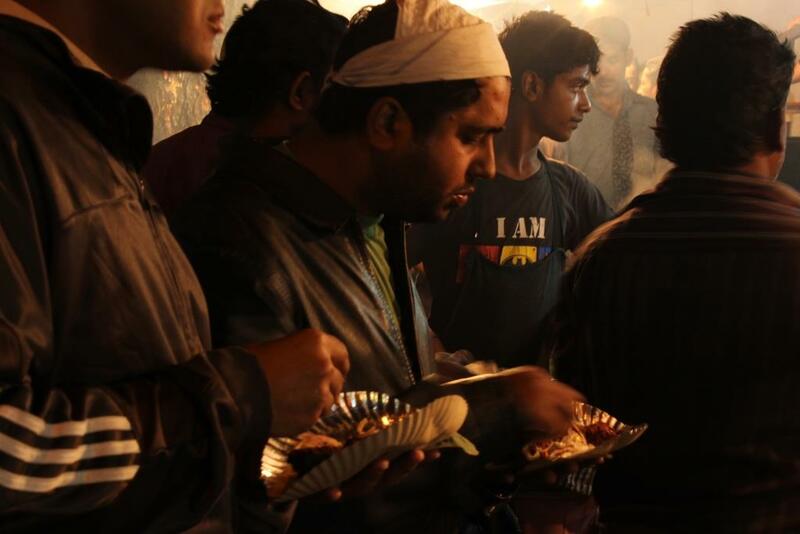 Fasting in Islam has strict protocols. The abstinence is total. But the celebrations are total as well. There is sense of bonhomie as ravenous regulars crunch, tear, bite, gobble and refill with happy abandon. Burqa clad ladies eat rapidly, huddled surreptitiously in a corner. Devout fans of the establishment wolf down large chunks of meat, giving the phrase `hand to mouth existence’ a new meaning. 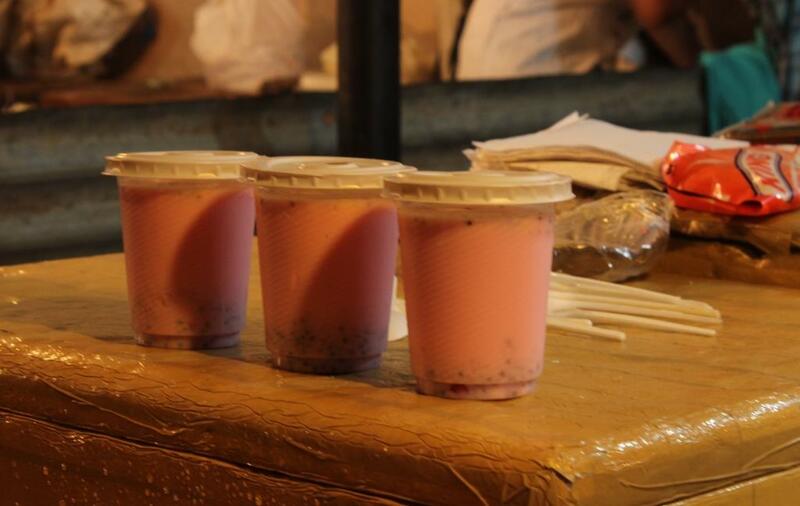 Lips are smacked with relish, fingers licked uninhibitedly and then it’s time to extend greedy hands towards a baby pink `falooda’ and dessert- qubani ka halwa, kulfi, gulab jamoons and the uber-rich hareesa. Thoroughly satiated, the carnivores stagger down the pavement, wiping greasy hands on hankies and sighing with spiritual devotion. They make way for a fresh throng who lunge forward with visible relief. 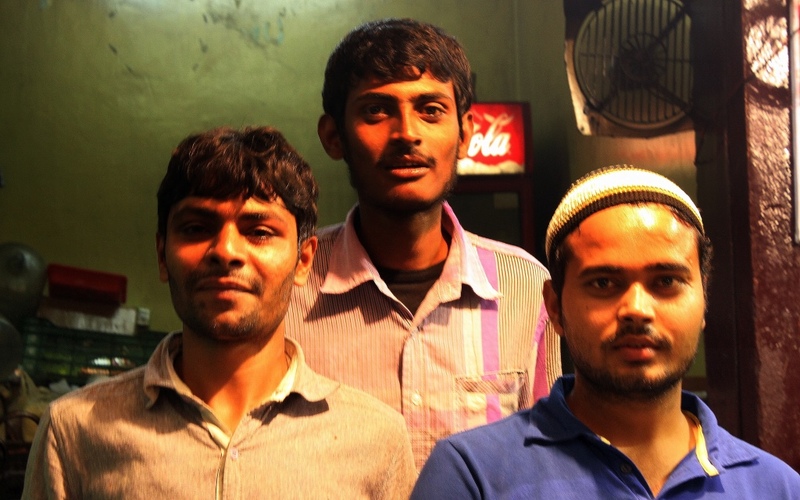 The boys at Zayan Kabab Centre, open all year through. I grin back and head home jauntily, loaded with food stuffed plastic bags of varying size, smell and shape. I’m sure the Neanderthals must have felt the same when they brought home the bison. Where to find it : MM Road, Mosque Road, Robertson Road, Frazer Town, Bangalore East. When : During the month of Ramzaan, 6 pm onwards. Write your reviews of food in Frazer Town and list your favourite kabab joints here.Would love more information. fab article, yet again. 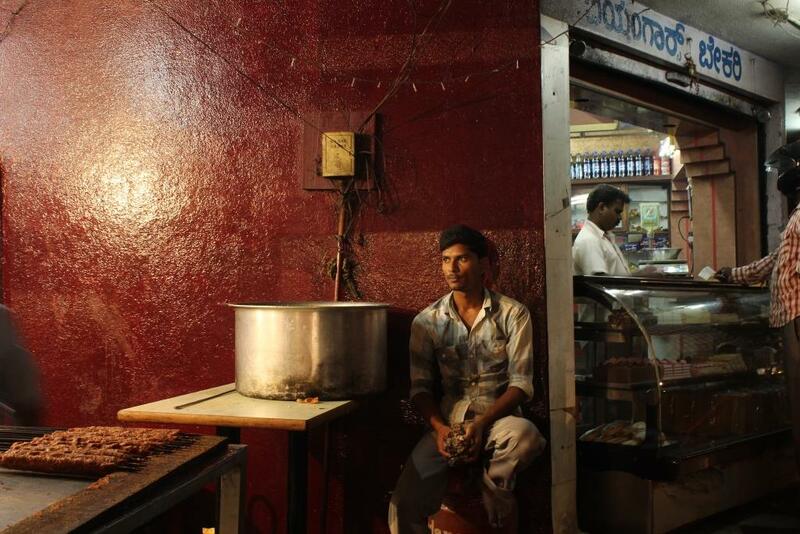 a small query… where does the man who sells the FANTASTIC round kulfi imported from Bombay every thursday, ply his trade? I’ve heard he is somewhere on MM Road, but where???? Kirtana, is it Mr.Ahmed at `Bombay Chowpatty Kulfi’? He serves fruit and matka kulfi-falooda.41/b, Mosque Complex, MM Road, Frazer Town, Bangalore.Phone 25488811.Let me know if this is the one! 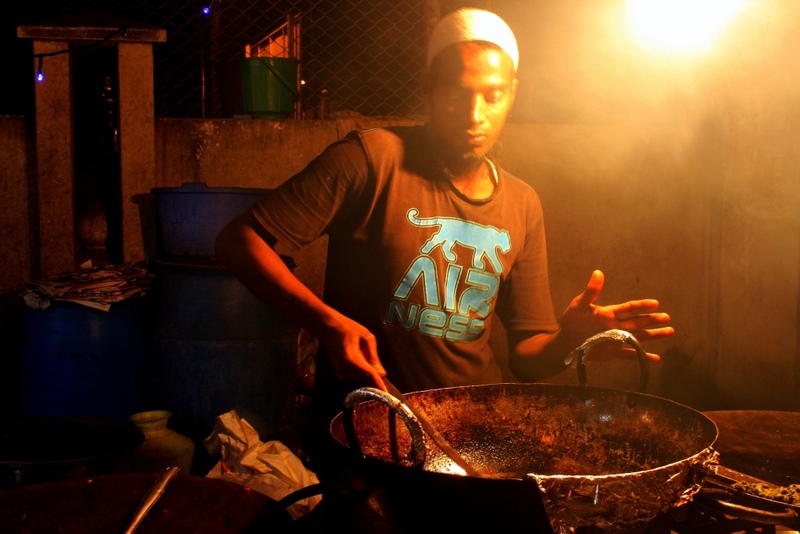 I enjoyed the anda roti literally bathed in oil during the last ramadhan near the Haji mosque. Planning to visit one of the days before the month is over. Hope you have a good time, Praveen. went on a sunday evening . got down at masjid road and walked up to MM Road junction. 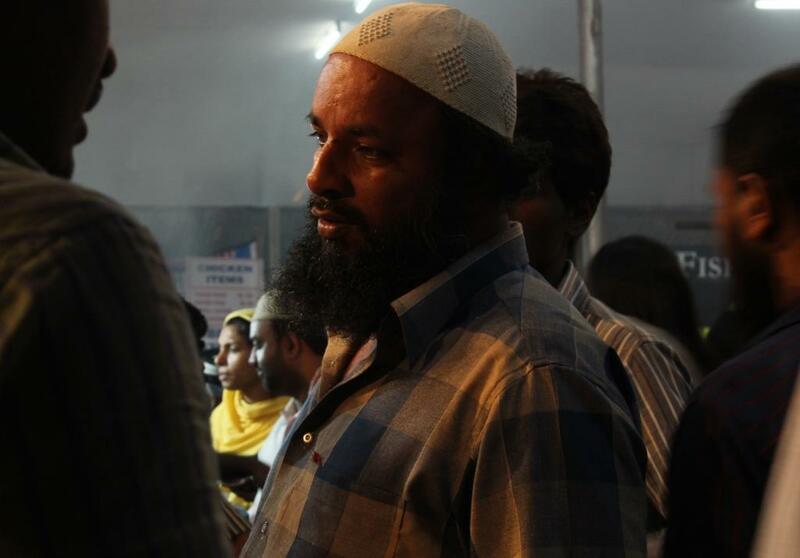 Last time i went to an iftaar stall was near jama masjid in Delhi, and the smoke coming out of the temperory stalls created just the ambiance. there was a lot of rush and everyone seemed to be immensely enjoying some of the best shops setting up stalls along side the small family run stalls. 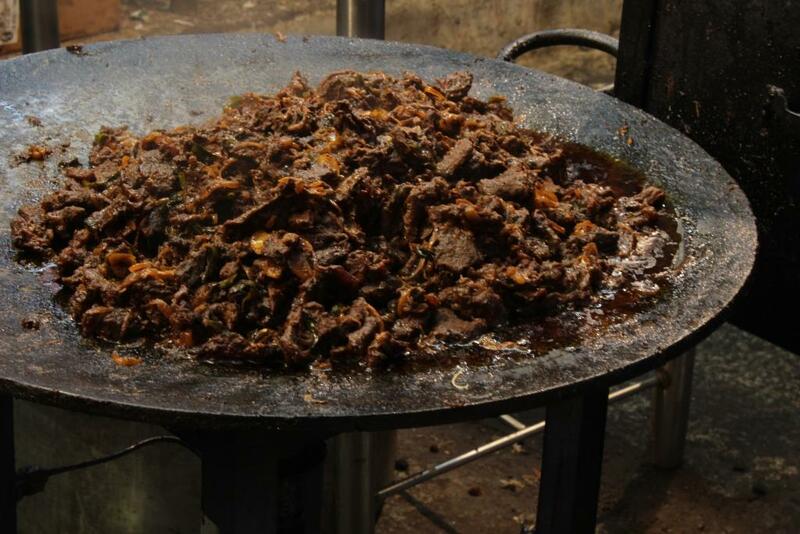 I ate Khubani ka meetha and Mutton seekh kabab. Getting kadoo ka meetha, mutton biryani and firni parcelled for the lunch next day at office. absolutely lovely food. returning friday again. Hey Anand, this is lovely! Thanks for sharing this with us.I wanted to eat everything in sight, if my conscience would permit me! Mouth watering description!!! Wish I knew about these places when growing up in Bangalore. The article itself gets me hungry even though am a vegetarian. Would love to go and taste e desserts.